As you guys know I added a new series in my blog called gaming. So I will update a random post about my play in my favorite games. 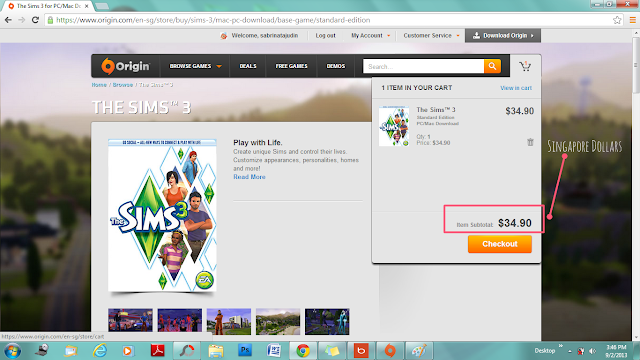 Will start with The Sims 3 although I know The Sims 4 is coming up right. Hopefully I can purchase the Final Fantasy 14 soon. <3 But oh well. I just got the chance to purchase it, the awesome part, I was lucky enough to get during the sales season. I bought the Base pack for only RM20.00+ (10.00SGD) originally was 30.00+SGD. The downside about buying online is that you wont get the physical package that you can uh.. collect and stare. So if there is still anyone is is new to The Sims games, basically, you need the Base Pack first, then you can add and buy more Expansions, to add more fun and stuff in it, As for now, I already have 3 expansion Packs, that is The Katy Perry Sweet Treats, High End Loft and Outdoor Living. All of theses are Stuff Packs, which means I only bought it for an extra stuff in my game. The expansion pack is more of a story or a new world, for example Pets (You can have pets), Island Paradise (You can be a mermaid and have a world decorated like a beach world) and many more. So lets get down to the basic. So select the prefered base pack as usual and add to cart. Read your cart summary and proceed to check out. Automatically it will have a Paypal payment button for your ease. I have a Paypal account. Someone request to do a Paypal blog post on how to have it or the basic things about it. In sya Allah I will do it, since Paypal is a very useful topic especially if you love shopping internationally. 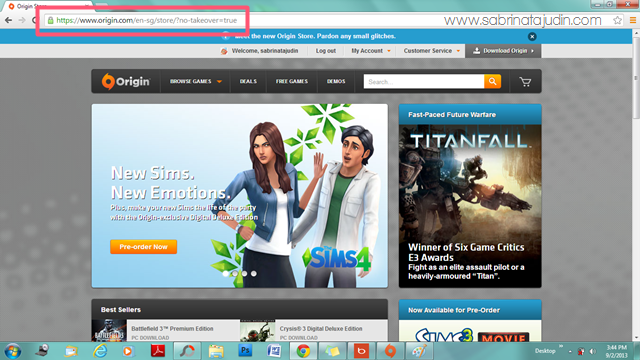 Then, after that, there will be a pop up window ask for you to Login your Origin account, Register if you don't have one. 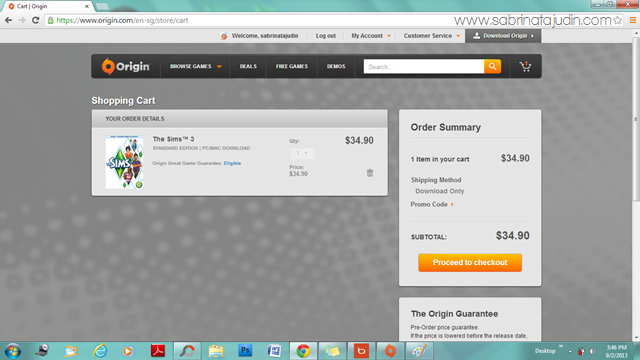 This is very important, your game will link to your Origin account. Username and password are the same as you original The Sims game account. 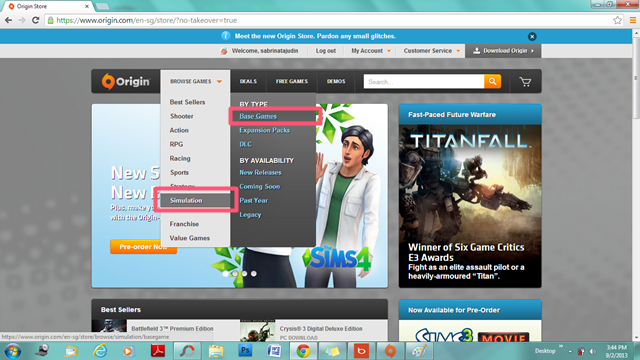 (The Sims 3 account in the The Sims official website). There will be a download link and click it. 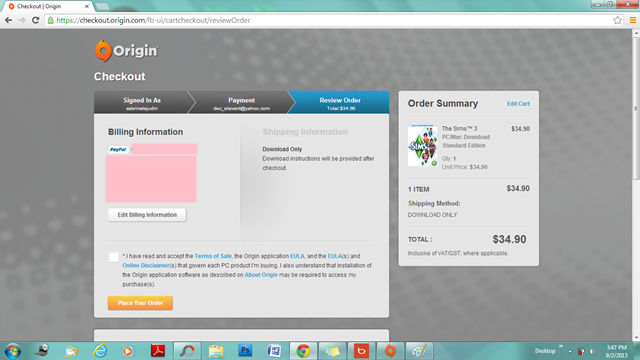 The download is pretty easy, so all you need to do is wait. Although I am using uniFi. It takes about 6-7 hours for it to fully download. So that that in mind, make sure you are not going anywhere and no interruptions during downloading. So what is the different? Compare to the retail store that sells these original The Sims games, the price is way higher.From what I can remember is the price for the games are RM100+. If you are lucky enough to catch up during the sales like I did, be sure to download. I bought mine as I said for only 10.00SGD. I was trying to find the disc to my sims 3 game yesterday!! I was so upset when I could not find it grrr.. 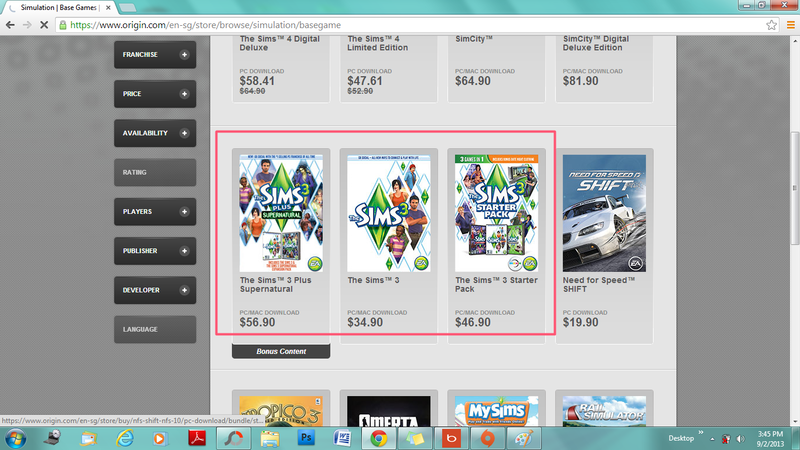 I wish the game came with all the expansion packs built in.. What are your thoughts on the new Sims 4 game? true! its takes alot of money to keep expanding the expansion and sadly to say, the base pack the sims have pretty limited stuff that encourage you to buy more expansions. the sims 4 said it will be more "expression", well, i dont really care about that, i hope there will be no more rabbit hole in the sims 4 games. i like the sim tooooooooo!!! aah, such memories. I played Sims mase darjah 5 klu x silap. Then stop after entering boarding school.. They have Katy Perry what?? so cool~! aah, that is the expansion pack. not liking that one. i bought it and meyesal because not that much of an "extra" stuff in there. Hi, I know that this was posted a long time ago but i can't find any other store that sells The Sims 3 for the pc/mac version. May I know whether you know other ways to buy the game from origin for those who does not posses paypal or visa, mastercard and the likes? Hi Ara, I had the same problem since Malaysia banking did not allow debit card usage/paypal to purchase game online. The other way is you can buy in cd version in authorize retails stores like the one in Mid Valley KL i think or in Johor Impulse Megastore.